Stamp Whisperer: What...she's back...catching up. Happy Thanksgiving, Merry Christmas and Happy New Year. I am SUCH a slacker. I have been creating but haven't been done much blogging. For the first time in my husbands and my life we spent Thanksgiving alone. We went to a little town out west called Ouray, Colorado. It was cold and beautiful. We stayed at a lodge that had natural hot springs and went out to dinner at a restaurant called The Outlaw. We hiked to the water fall and shopped the little town. Oh and went to the brewery/pub for local craft beer. Here are a few pictures. Okay stay tuned tomorrow for Christmas... I will end with a card. The Stampin' Up! Occasion Catalog went live January 6th. It goes thru June 2nd 2015. It is a great catalog with lots of kits that are easy and beautiful to make. If you have a demonstrator, awesome! If you don't I would love to be your demonstrator, your own personal crafting go to gal!. 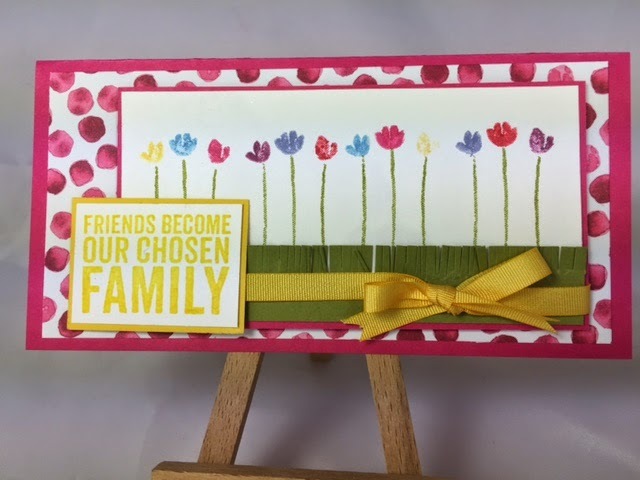 I made this card using the stamp set and paper on page 19 of the Occasions catty. It is called Paitned Petals.